Toshiba Dynadock Wireless U: The Perfect Docking Station? We may be living in the age of Wi-Fi and Bluetooth, but much of the laptop experience is still heavily wired. Me? I'm tired of being chained to a desk by my speakers, external display, and assorted USB devices. 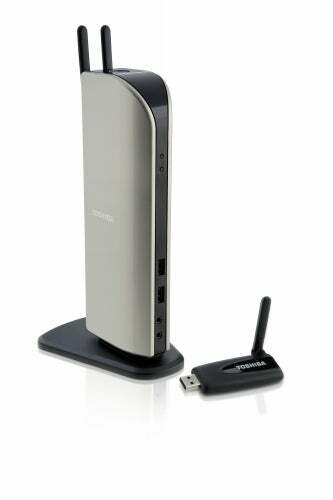 Luckily, Toshiba's Dynadock Wireless U ($300 from Toshiba, $250 from Amazon.com; check out PC World Pricing) wireless docking station showed up at the office. I took a couple days to play with it, and here are my initial impressions. The Dynadock Wireless U packs a DVI connector (with VGA adapter), six USB ports, a digital audio port, and an Ethernet port, as well as line-in, headphone, and microphone jacks. Anything you plug in will be usable by your laptop, which it connects to via an included USB stick. You could leave your cameras, phones, speakers, and so on connected to the dock while you roam around the room on the laptop with full access to your devices, or you could work from the hub by connecting a full keyboard and mouse to the USB ports and hooking up an external display while your laptop sits elsewhere. I tried it out with a couple different laptops (a top-flight Alienware M15x laptop running Vista and an aging ThinkPad with 1GB of memory and a 1.8-GHz Pentium M with Windows XP) and got mixed results. The installation process was a pain--it involved several restarts and the occasional plug-and-unplug troubleshooting. It would have been nice if the Dynadock Wireless U had one central application that governed everything. Once the Dynadock was properly synced to a PC, however, it was no trouble at all to plug in Ethernet cables, USB devices, audio gear, or monitors and start using them. One of the Dynadock's claims to fame is its discrete audio/video hardware, which lets you use an external display and audio gear. Once everything was set up, I decided to take the external display functions for a spin by catching up with The Simpsons on Hulu. Make no mistake: While watching video is certainly possible with the Dynadock Wireless U, it's not always pretty. In battery conservation mode, the display connected to the Dynadock Wireless U teetered between somewhat watchable and barely watchable while the Alienware's laptop display worked fine. Once I brought it up to high performance mode, the Dynadock-connected display dropped far fewer frames, but there was still some noticeable skipping compared to the laptop display. Testing with the older ThinkPad yielded similar results--HD YouTube videos that played full-screen without complaint on the ThinkPad's display showed noticeable lagging in a window on the Dynadock-connected display and simply refused to play full-screen. Lower-resolution videos (we used 320 by 240 and 480 by 320 clips) played back splendidly, but a 1080i clip looked like a slide show. Audio worked fine--nothing lagged, and there was no discernable difference in quality. While the Dynadock Wireless U's wireless range isn't advertised, I came up with a couple ground rules during testing. First, don't expect to get video streaming at all beyond about four feet. Basic computer functions like word processing and Web browsing function very well as much as twenty feet away, as long as the wireless USB stick maintains a line-of-sight connection with the hub. Second, no walking around while you're typing. Besides basic safety concerns, it takes the Dynadock Wireless U a few seconds to adjust to a different position. All in all, it seems like the Dynadock Wireless U is good for someone who craves a little flexibility in their home docking setup. I just wish it was a little more plug-and-play friendly during the initial install process. Just remember that while your laptop may be free, your usage is still chained to reality: The Dynadock may not be able to handle what you have in mind.